You can Ritual Summon this card with “Rebirth of Nephthys”. You can only use each of the following effects of “Cerulean Sacred Phoenix of Nephthys” once per turn. ● During your Main Phase: You can destroy “Nephthys” cards in your hand and/or face-up field, then destroy an equal number of monsters your opponent controls. ● During your next Standby Phase after this card was destroyed by battle or card effect and sent to the GY: You can Special Summon this card from the GY. This monster appears to be the released form of Nephthys, the Sacred Preserver. This monster appears in the card artwork of Last Hope of Nephthys. 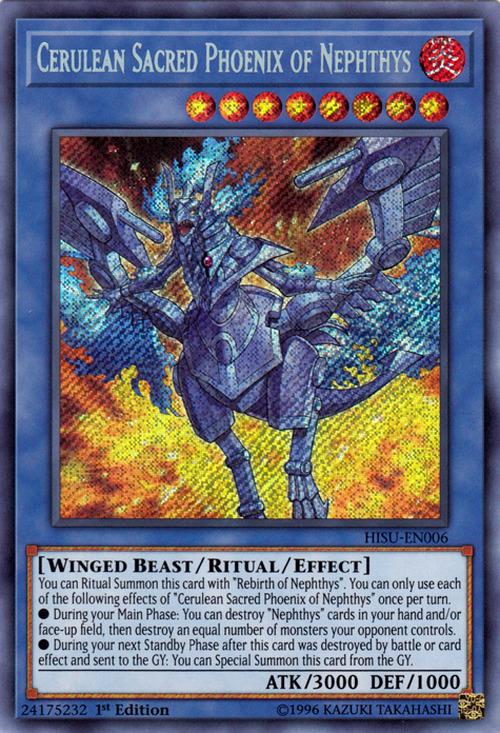 This monster has the same combined ATK and DEF as the original Sacred Phoenix of Nephthys.